Hide your kids, hide your wife. There's big news afoot! Attention Chicago and Suburban folks: Shamrock Shakes are NOW available at area McDonald's. The Babe had her first one EVER yesterday and loved every drop of it. Stop what you are doing and get out to McDonald's RIGHT NOW. What's that? 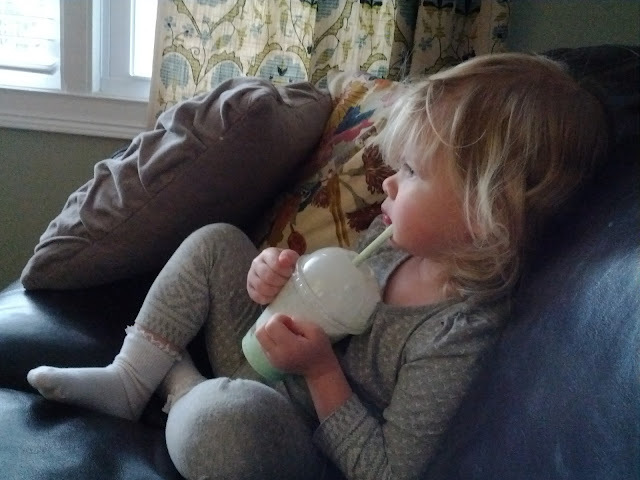 Giving our daughter a milkshake while she mindlessly watches tv? Sweet parenting! P.S. Hide your husband, too! In my defense, as her mother, it had been a rough day AND she is watching Downton Abbey. That milkshake was the only reason she was sitting still. We paid for it later when she was doing laps around the dining room table instead of going up for her bath!